LEE'S SUMMIT, MO / ACCESSWIRE / March 5, 2019 / Lee's Summit, Missouri based Powers Sports Memorabilia is pleased to announce that they are accepting orders from now until 25th of March, 2019 for the upcoming Calvin Johnson signing event sponsored by MCSG. 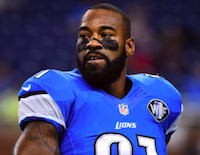 "Don't miss out on this rare opportunity of getting Calvin Johnson's autograph. It has been a few years since he had a signing event, so take advantage of this chance to purchase signed memorabilia from us, or you can send one of your own items to us for his signature," said Matt Powers from PSM. Calvin Johnson is considered one of the National Football League's (NFL) greatest wide receivers of all time. He was drafted by the Detroit Lions of the NFL, second overall in the 2007 NFL Draft, and played for the Lions for all of his professional career until he retired in 2016. The future NFL Hall of Famer was also a former Lions Pro Bowler and is a member of the College Football Hall of Fame as a Georgia Tech Yellow Jacket. Meanwhile, as noted on Powers Sports Memorabilia's website, Johnson's fans will have the opportunity to get their hands on a number of autographed items and memorabilia, including Lions 8x10, 11x14, 16x20 photos, Lions/GT mini helmet, Lions/GT full sized (replica), Lions authentic full size, helmet, NFL authentic football, GT custom jersey, and Lions white authentic Nike elite jersey (identical to the ones on the field) - with free shipping. Customers can also opt to send their own personal items and sports memorabilia to Powers Sports Memorabilia for Johnson's autograph, and the company will ship them back at an additional cost. Fans can also request the 'Megatron' inscription, or any other inscriptions up to five words, for an extra fee. Interested parties may view the Facebook page or visit Powers Sports Memorabilia's website to learn more about the available merchandise. Powers explained that Powers Sports Memorabilia fully guarantees the authenticity of their products because all of them come from the athletes themselves. He said that every item from their store has a certificate of authenticity and is verified by a number of established institutions, including Major League Baseball, PSA/DNA, Beckett, and JSA. "Furthermore, we also provide our clients with free shipping and a hassle-free exchange and return policy," he added. Sports fanatics may consider checking out Powers Sports Memorabilia's website to learn more about their products and services. They are regarded as one of the leading sports memorabilia stores in the Missouri area, based on a number of positive reviews and recommendations received online. Leon L. said in a Google review, "I have been buying and collecting sports memorabilia for over 15 years, and I have been a dedicated and loyal customer of Powers Sports Memorabilia for the last 8 years. I have purchased many items for gifts, charities, and personal collection, and have never been disappointed by Matt and his team. Autograph signings do not always go smoothly because of the personalities involved, but Matt and his team always make things right! They are trustworthy, extremely knowledgeable, and 100% service oriented." More information can be found on Powers Sports Memorabilia's website. A number of instructional videos about sports collectibles can also be found on their YouTube Channel. Furthermore, interested parties may contact Matt Powers of Powers Sports Memorabilia, or connect with the company through their other official social media pages on Facebook, Twitter, and Instagram to learn more about their autograph signing events, ongoing promotions, and important announcements.